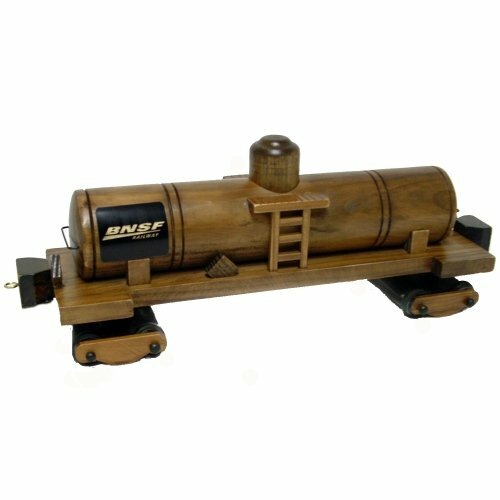 Our Oil Tankard Railcar is just one of our extensive line of Wooden Collectible Trucks, Trains and Equipment. Each comes filled with a bag of Jelly Bellies, combining all of the advantages of giving the great taste of food gifts with all of the value added, and longevity, of giving a trophy or award. These collectibles are so ?coolin they?re guaranteed to stay on your clients book shelf or desk long after the goodies are enjoyed! The perfect corporate gift for construction, distribution, railroad, transportation, trucking or warehouse industries. Price includes laser engraved 1-position imprint. Modern Train Engine dimensions: 12 3/4? L x 3 1/2? W x 4 1/2? H.
Imprint area: 3? W x 3/4? H.
Individual Shipping Weight: 4 lbs. (3 lbs. Empty). Imported Item.